Blackberry whisky is one of the finest of all infusions, a rival even to sloe gin. Do use cheap whisky for this recipe as there is a special pit in hell for those who drink good whisky in any way other than on its own. For those few who do not like blackberries and the many more who do not like whisky there is some good news. Given time - about a year, but two is better - the flavour mellows into something quite its own, not dissimilar from port, and with never a hint of peat bogs and barely a trace of blackberry crumble. 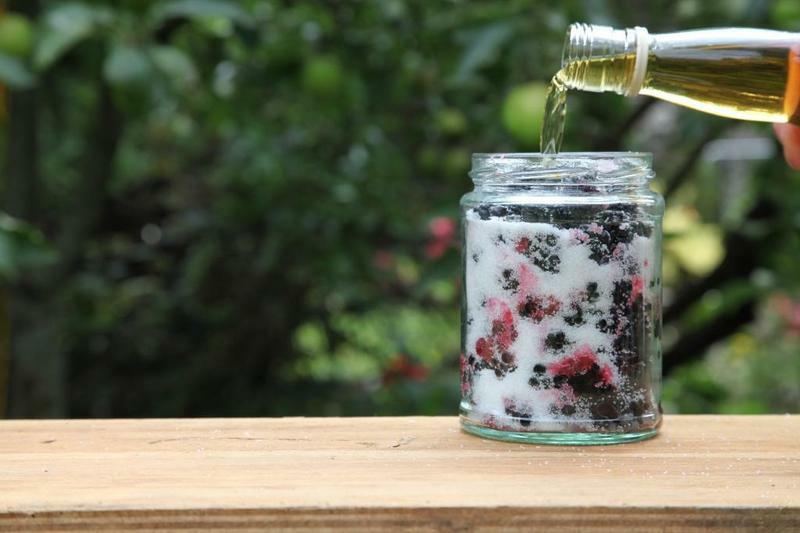 Two-thirds fill a Kilner jar with blackberries, then sprinkle sugar over them until it covers the bottom half of the fruit. The blackberries should be dry for this operation otherwise the sugar will not flow. Top up the jar with whisky, close the lid and shake gently. Store in a dark cupboard and shake once a day until the sugar has dissolved. Decant the infused whisky into a bottle after 6 months and store for as long as you can to mature. The sweet whisky-soaked blackberries are quite delicious so do not throw them away! Weights have been dispensed with here as volumes guide this recipe. Raise a glass to delicious drinks and traditional methods, with a day of booze brewing and infusing at the River Cottage Cookery School.